Synonymous with the youth movement and counterculture fashions of the "Swinging Sixties," the boutique radically changed ways of making, marketing, displaying, and buying clothing. Names and places such as Mary Quant, Biba, Paraphernalia, the King's Road, and Carnaby Street evoke the spirit of freedom, individuality, and rebellion that characterized the social upheaval of that decade, and defined a style of dressing. As a retailing concept, the boutique is associated with a distinct identity that reflects the taste of the designer or owner; small-scale production with rapid turnover of merchandise; fashion novelty and experimentation; innovative displays and interiors; and an informality among owner, salespeople, and clientele. Although the boutique phenomenon of the 1960s played itself out by the mid-1970s, boutiques remain a vital part of the commercial world of fashion- whether as an individual enterprise or incorporated into a larger setting, such as a department store. Small retailing establishments were not new to the post-World War II period. In the first half of the twentieth century, Paris, London, and New York all had specialty shops. Usually owned by a single designer or proprietor, these operated between the highly exclusive couture houses and the large department stores, and catered to a well-to-do clientele with an emphasis on personal attention to the customer. As early as the 1920s, Parisian designers began to open small shops within the premises of their maisons de couture where they sold a variety of (often less expensive) merchandise including accessories. In 1925 Jean Patou, for example, opened Le Coin des Sports (The Sports Corner), a series of rooms on the ground floor of his couture house that offered specialized sports clothing. From its opening in 1935, Elsa Schiaparelli's boutique featured unorthodox and whimsical window arrangements that anticipated the eye-catching, frankly outré displays and interior decor of 1960s boutiques. By the 1950s, boutiques were well-established venues for selling designer clothes and accessories. The coming of age of the baby boomers in the late 1950s and early 1960s created a new consumer market that significantly affected the boutique explosion. The economic hardships of the war years had ended and a period of prosperity began in both Europe and America. Young men and women not only had money to spend but also sought to distinguish-and distance-themselves sartorially from their parents. Dissatisfied with what they saw as outmoded, irrelevant, and conformist styles promoted by the Parisian haute couture, emerging young designers, particularly in Britain, began to create clothing that reflected a new aesthetic and attitude toward dressing. Equally significant was their determination to produce clothing that was affordable to their peers. Rather than work within the restrictions imposed by a couture house or a large manufacturing company, these designers often began by sewing garments in their homes and opening boutiques in out-of-the-way locations. Dubbed the "Swinging City" by Time magazine in 1966, London was the undisputed capital of the youth movement in the early and mid-1960s, and young British designers were in the vanguard of the boutique scene. Of this group, Mary Quant was the highly influential pioneer. Her boutique, Bazaar, which she opened on King's Road in 1955 in partnership with her publicist husband, Alexander Plunkett-Green, and business manager Archie McNair, was the first of its kind. Bazaar offered clothing and accessories aimed at a youthful audience ready for fashion that emphasized informality, irreverence, and playfulness. Quant's Bazaar set the standard for the many boutiques that opened in London and New York in the following decade, including Barbara Hulanicki's Biba; Alice Pollock's Quorum, which featured clothes by the celebrated husband-and-wife team of Ozzie Clark and Celia Birtwell; the entrepreneur John Stephen's numerous emporia on Carnaby Street; and Paraphernalia, where Betsey Johnson's exhibitionist designs were modeled by Warhol "superstar" Edie Sedgwick. Inventive window displays and interior decor not only formed a particular boutique's image and identity, they also added a sense of fun and discovery to the shopping experience. Unconventional windows were designed to engage-even shock-passersby. At Bazaar, Quant created whimsical vignettes using attenuated, stylized mannequins in awkward poses, props, large-scale photographs, and banners. Historicism was the hallmark at Biba that would become famous for its art nouveau and art deco inspired interiors (and fashions). Paraphernalia was characterized by a space-age minimalism in which white and silver predominated. In these varied settings, clothes and accessories might be hung on walls or old-fashioned coat stands (as at Biba), or tucked away in dimly lit corners. The unexpected juxtaposition of different types of merchandise also encouraged the boutique shopper to linger and explore. Although Biba's clientele was primarily working-class while Quorum was patronized by the Rolling Stones lead singer Mick Jagger, Marianne Faithfull, and other pop stars, boutique shopping in the 1960s was a shared social experience among young men and women. Strolling down King's Road or Carnaby Street and frequenting the "in" shops were part of the hip lifestyle. Boutiques were first and foremost places to see and purchase the most up-to-the-minute styles, but they were also "happening" places where one went to meet friends and listen to the latest rock music. Their generally small, often dark interiors and casual atmosphere fostered an intimate ambience. Some boutiques (such as Paraphernalia) stayed open late at night; music and live models dancing on platforms further blurred the distinction between store and party scene. By the late 1960s and early 1970s, the success and popularity of boutiques resulted in their being co-opted by mainstream fashion and big business. In New York, large department stores such as Bloomingdale's opened designer boutiques aimed at attracting a share of the enormous youth market. Geraldine Stutz, president of Henri Bendel, transformed the staid specialty shop into a highly visible showcase for the work of young British, American, and French designers, each with their own boutique space. 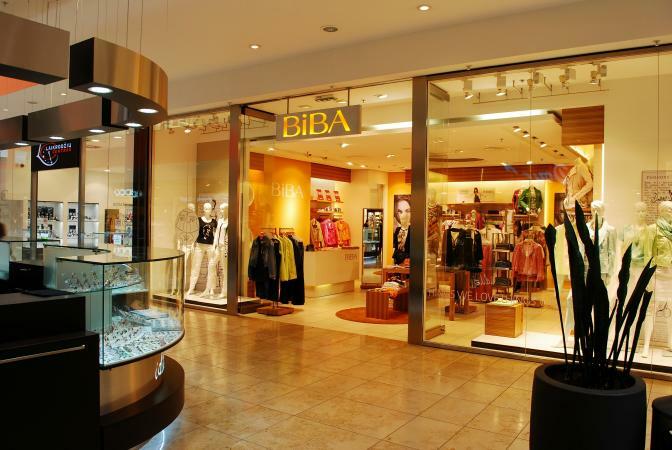 By the time it closed in 1976, Biba had moved twice from its original, small location in Abingdon Road to occupy the former premises of Derry and Toms, a 1930s multi-storied department store in Kensington High Street. In the "Swinging Sixties," fashion was a defining aspect of the counterculture movement, and boutiques were the matrix in the creation and dissemination of those fashions. The boutique scene introduced a new set of expectations regarding fashion and shopping that is still a factor in the early twenty-first century. Boutiques expanded the concept of fashion as catering to more individualized-and adventurous-tastes. Along with the multiplicity of styles available was the possibility for creative self-expression through clothing, while the shopping experience became part of fashionable behavior. Boutiques continue to offer alternative fashions to elitist haute couture and mass-produced, mass-distributed ready-to-wear. See also Biba; Mary Quant. Bernard, Barbara. Fashions in the 60s. London: Academy Editions, 1978. Fraser, Kennedy. The Fashionable Mind: Reflections on Fashion 1970-1982. Boston: David R. Godine, Publisher, 1985. Mendes, Valerie, and Amy de la Haye. 20th Century Fashion. London: Thames and Hudson, Inc., 1999.